A few quick keyword searches online and bam! I had my answer—all systems were a go on the foodie front, Jordan offers dozens of dishes consistently cooked vegetarian and the country is touristy enough to easily communicate the concept of vegetarianism (a marked contrast to traveling China as a vegetarian where culture and poverty create an environment where there is no widely understood direct translation). 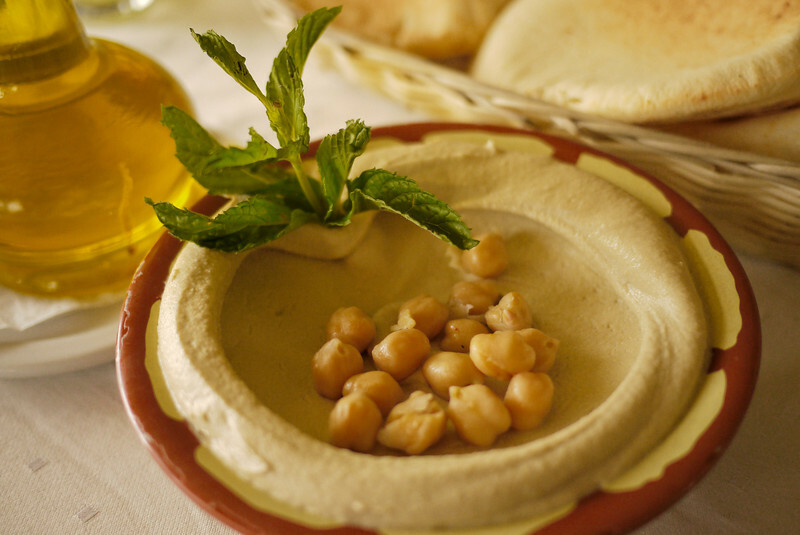 Learn More About Middle Eastern Foods! Jordan sits right in the heart o f the Middle East and on the edge of the Mediterranean region, giving the country flavors and influence from nearby Syria, Lebanon, Turkey and Greece. This proximity to so much cultural diversity seeps into Jordan’s national dishes and cuisine; nearly every single one of these vegetarian dishes can be enjoyed throughout the region. My favorite dishes, and the dishes appealing to most vegans and vegetarians are mezze, or rather a spread of small appetizers. Culturally, these dishes are served at the start of the meal and served family-style. Family-style is a bit opposite from the American meal mentality, where meals are plated and served individually. Instead, small dishes are spread throughout the table for sampling and we ripped off chunks of pita and dunked right onto the plate. Warning: Traditional cooked meals in Jordan feature a lot of meat (lamb is popular), but the selection of mezze are healthy, filling, and delicious! You’ll a couple of phrases to order your food and ensure it’s vegetarian. Breads will be served with each and every meal, though they differ in texture and thickness, and even flavor for the breads cooked near an open flame, they are delicious and were always served completely fresh. In addition to using the breads for dipping and scooping your mezze and meal, there is often a bowl of za’atar seasoning on the table—feel free to dip your pita in olive oil before scooping some za’atar seasoning as well! 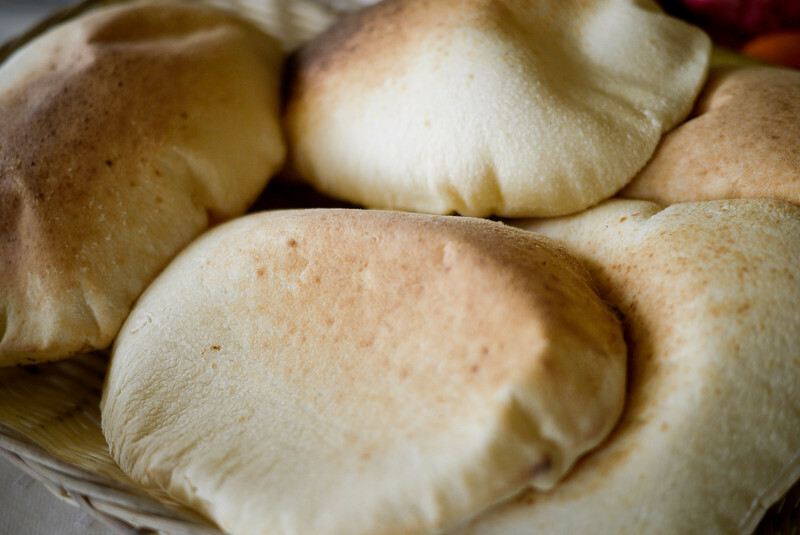 Pita bread is a staple part of the diet and served with every meal. It’s completely acceptable to tear the bread with your fingers and use your pita to dip into the family-style mezze served on the table. Seconds are also fine too so don’t hesitate to grab some more from the basket on the table because there is always extra bread nearby, an endless supply it often seems! 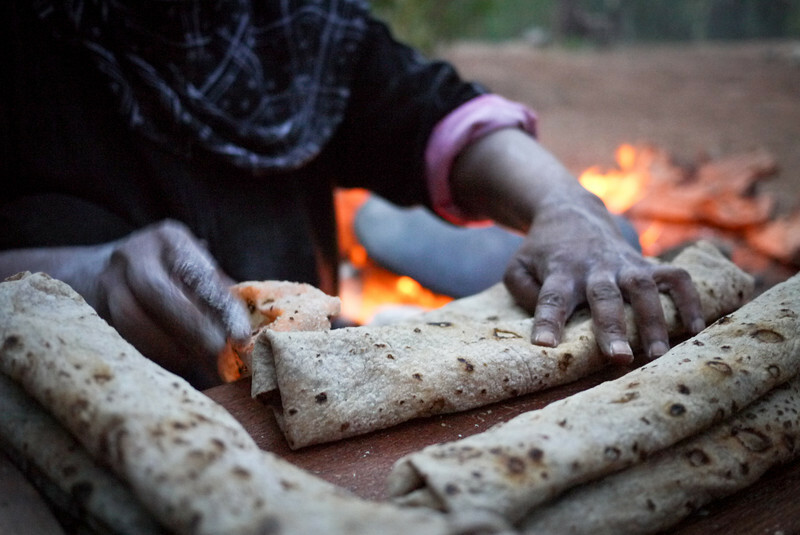 A woman making making the thin, traditional shrak bread in Jordan with the firelit saj in the background. Shrak is a delicious whole-wheat Bedouin bread. Shrak is baked on a dome-shapped griddle (a saj) with an open fire beneath; this bread is tossed thinly and then lays over top of the griddle. Fresh fruits and vegetables play a large role in the diet within this region; you’ll find most salads have natural dressings like olive oil and lemon. The olive oil is delicious and local, and because olive trees grown so well through the Levant and Mediterranean region, the oil is far cheaper than the olive oil I purchase back home in the US—I am supposing that is one reason so many dishes are served coated in oil! Most of these salads are tangy because of the heavy lemon, so get ready to purse your lips on each first bite! 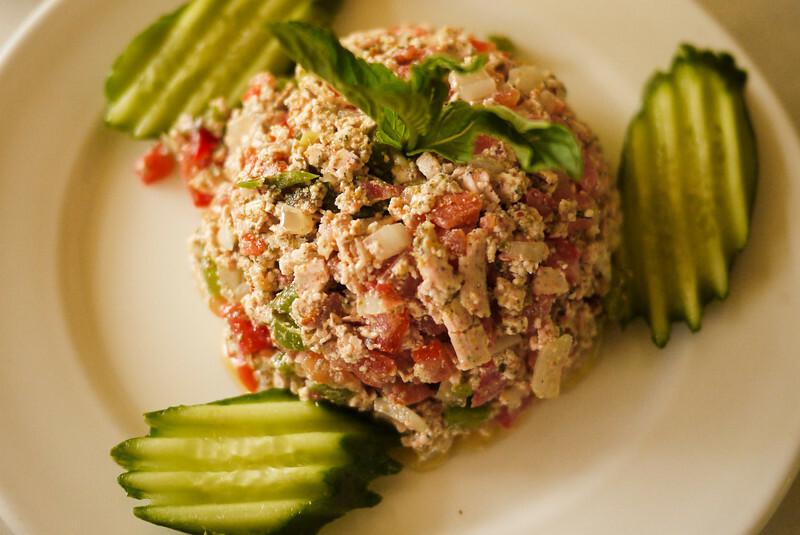 Fresh tomatoes and cucumber are sliced into thick chunks alongside … . The toasted pita bread is the highlight of the dish and such a tasty alternative to croutons. 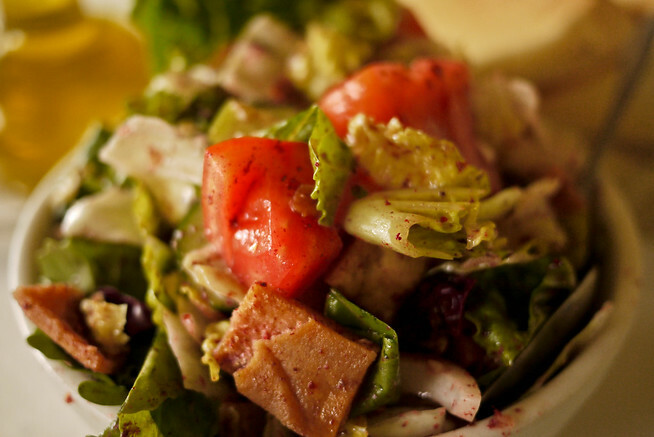 These items are tossed together into a dish with a light and zesty dressing. 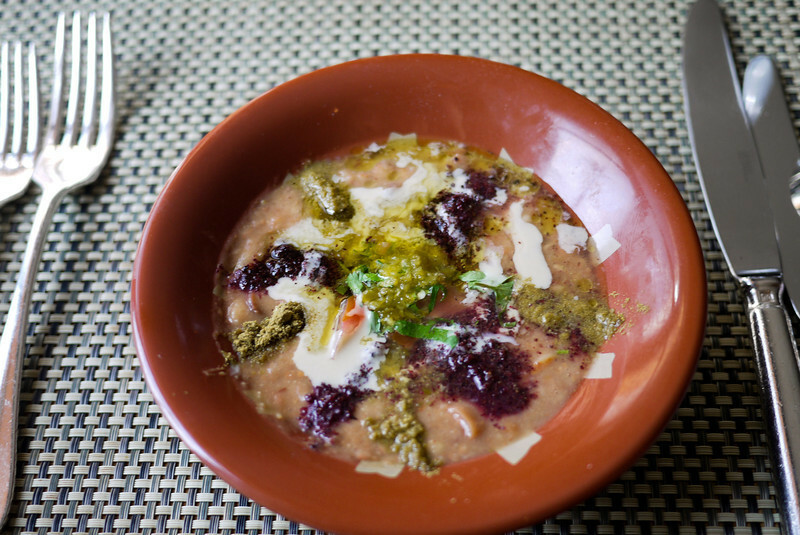 This is my favorite of the new dishes I discovered in Jordan…and the dish’s simplicity is the best part. I love traditional salads a whole lot, but the variety of non-lettuce based salads in Jordan was a welcome addition to my vegetarian diet. Another salad, quite similar with the large veggie chunks, but spicier is Ezme Salatasi; though I did not sample this dish in Jordan, it is a Turkish tomato salad you are likely to find on some menus in the region. 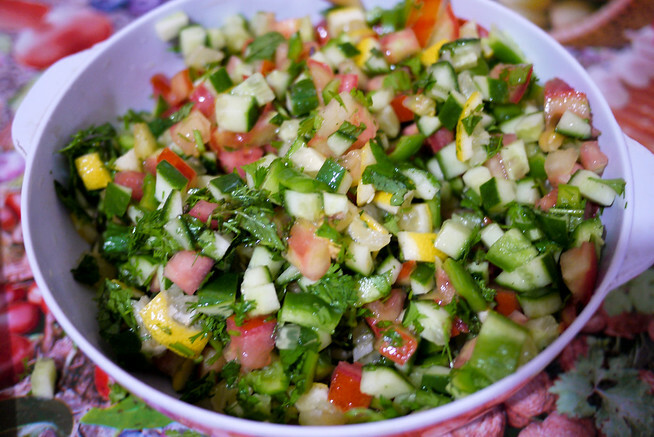 Like the Fatoush, this cold salad is served without lettuce. The catch though is that each part of the salad is finely chopped into small cubes before being tossed together into one bowl. Copious amounts of lemon saturate the veggies for a no-dressing-needed bowl of raw and tasty veggies…to be truthful though, the sheer amount of lemon in the dish took some adjustment time before I was able to eat the dish in large quantities. A no-chewing-necessary salad! 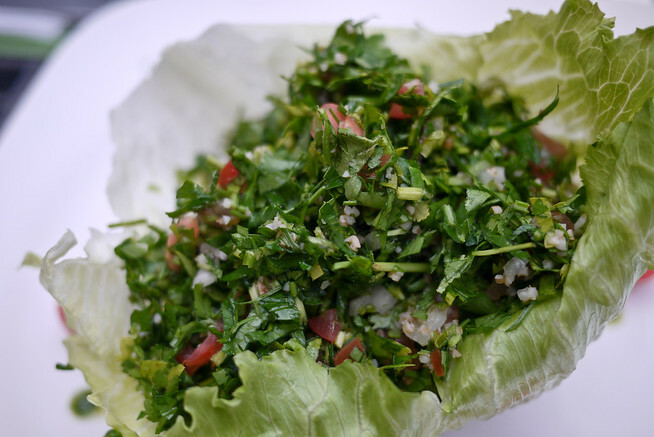 Okay, I kid, you do have to chew it, but tabouleh is made from bulgar and incredibly finely chopped veggies that include: parsley, tomato, and onion. The dish is then heavily soaked with oil and lemon juice. I grew up eating tabouleh and loved tasting the flavors in the dish so much closer to its home base. Shanklish is actually the name of the cheese used within this dish, but because the cheese is most often served with tomatoes and onions, it now refers to the whole dish if you’re ordering in a restaurant. I loved it; the soft cheese made the salad creamier than a traditional veggie and cheese salad and quite tasty! These are not my favorite dish; most often served as simply a plate of plain olives, it just doesn’t do much for my taste buds, but if you’re an olive fan then you are in great luck! Also, they like pickled sides, another delicacy I just don’t get so I’m lumping them with the olives! 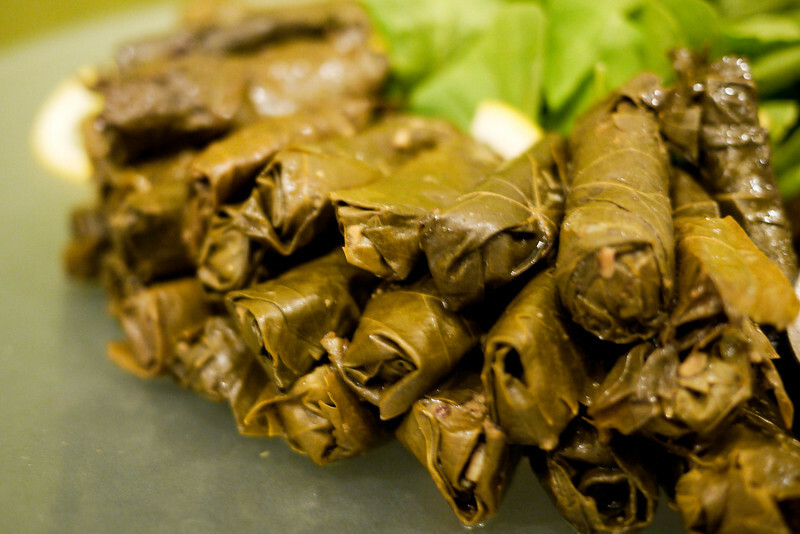 Dolma are rice-stuffed grape leaves and make a tasty snack throughout the region! Call this whatever you choose, bu the essence of the dish is grape leaves stuffed with rice, seasonings, and occasionally meat. In fact, some dolma are inherently vegetarian and others are not, so you’ll want to ask carefully before sampling since you have to bite into one of the dolma before you know what’s inside! Delicious and a quick pick-me-up, we snacked on these during a family-led cooking experience in Ajloun, Jordan. Most of these spreads include healthy doses of olive oil, just like the salads in this region. The spreads are most often creamy, with strong flavors. Again, lemon and garlic are popular (just like in the salads) but so is the smoky flavor of fire-roasted eggplant, alongside a rich sesame paste known as tahini. Hummus has crossed over nicely into the rest of the world and you’re probably already familiar with it, and even better if you’re already a hummus fan. 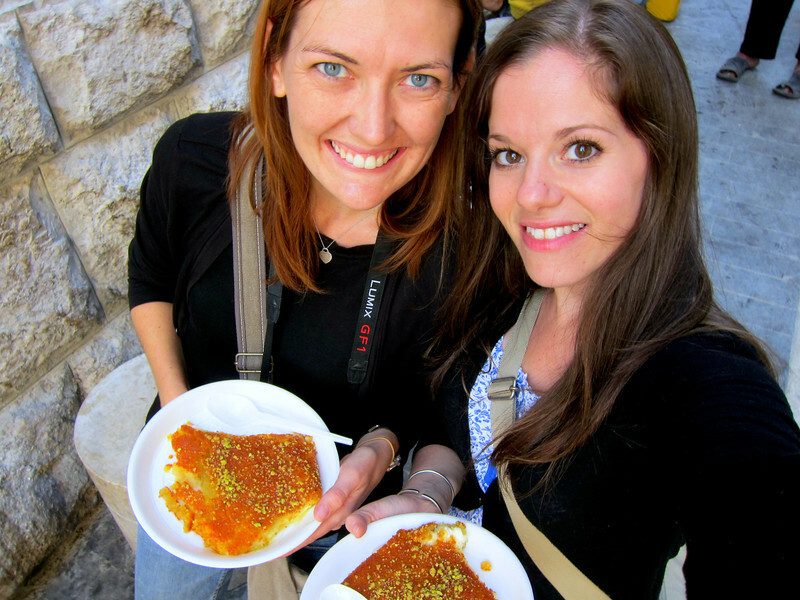 Plan on eating a lot of hummus while you’re in the Middle East and Jordan is no exception. Every single meal in Jordan started with a bowl of creamy hummus and pita and I enjoyed knowing I was getting a good dose of protein with every scoop! The dish is made from boiled and ground chickpeas blended with lemon, garlic, and oil into a finely ground paste and is seasoned to taste by the chef, so it adds a nice variety that it’s not actually standard prep throughout the region! 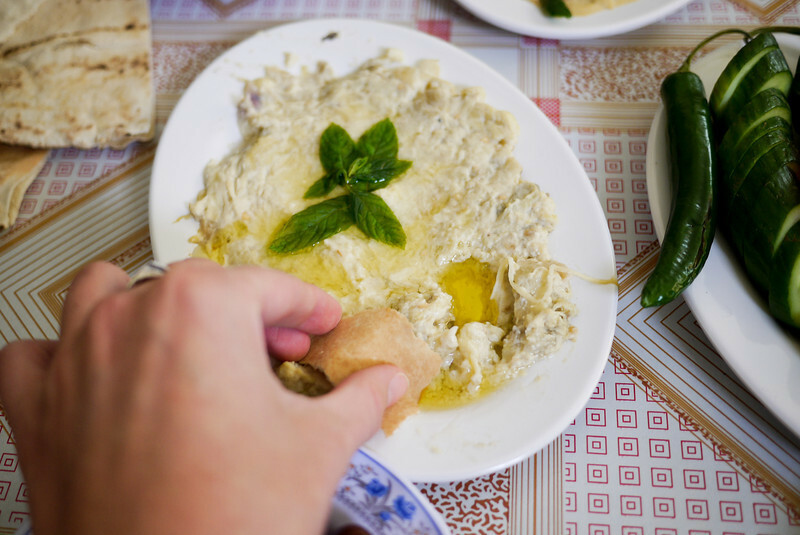 Digging into a plate of moutabel, a creamy roasted eggplant dip reminiscent of baba ghanoush, that was served as a family style mezze at a Druze family lunch in Jordan. If you’re familiar with baba ghanoush then you already have a pretty good flavor profile for moutabel, which is by far more popular in Jordanian cuisine than baba ghanoush. Both dishes are made from roasted and mashed eggplant, but the extra ingredients are what make these subtly different. Moutabel is served at the beginning of the meal, as a mezze. The dish is very heavy in tahini paste and garlic and once the dip is smoothed to a creamy finish, a heavy layer of delicious regional olive oil is doused on top. Moutabel is rich and very creamy because of the tahini and the smoked flavor is just delicious in contrast to the sharp citrus salads also served as mezze. This is the dish that has most often crossed over into Middle Eastern dishes all over the world, and for good reason. The smoky flavor of the eggplant is complimented with pomegranate molasses, tahini, finely chopped veggies and pine nuts. Tasty, and a fun way to change up the flavors if you bounce between moutabel and baba ghanoush as your mezze of choice. Having arrived in the Middle East from months eating and traveling within Thailand, I figured I was pretty much ready to tackle any spice the Jordanians threw my way. I was wrong. This dish is spicy! But tasty in small quantities; don’t order it alone as it works best in tandem with some of the other mezze like falafel, pita, and the crunchy fried cheeses. A creamy and thick yogurt, Labneh much more closely resembles the tartness and full flavor of Greek yogurt (which is also strained by the way) than it’s American counterpart. I ate this every single morning, and throughout the day too! Really insanely delicious on the often-served candied sweets like these tasty (but hideous) apricots. To be honest, there just are not a lot of traditional vegetarian cooked meals in Jordanian and Middle Eastern cuisine, they eat meat! Now, that is not to say that you will stave and be living from salads and spreads while you’re there—restaurant menus will offer pastas and other cross-culinary dishes when you’re in touristy areas. And in addition to the handful of adaptable dinner dishes, breakfasts and snacky type foods are delicious any time of day! Ful is my favorite of the cooked dishes, which some would say doesn’t say a lot about the sophistication of my palate since it’s actually a common dish (referred to as a peasant’s dish by some Jordanians), but the peasants do know how to make the most out of simple ingredients and spices! Ful is made from mashed fava beans as the base of the dish and is often served as a hearty breakfast. But fava beans alone hardly rate on the tasty-scale, so add in some fresh veggies and seasonings and it transforms the flavors. The extra flavors and veggies you’ll find added to the ful depends entirely on where you’re eating it. The Four Seasons Amman was my first sampling of ful on their full breakfast buffet and I had he whole rigamaroll to choose from: tomatoes, parsley, cumin, za’atar, sumac, and then drowned in a lovely layer of super-fresh olive oil. Like hummus, falafel has made the cross over to the global palate as a typical Middle Eastern food. And again, for good reason—it’s tasty! These little balls are made from deep-fried ground chickpeas and they are a jack of all trades in the regional diet. Eat them alone as a snack you just pop in your mouth, add a plate to your mezze at the beginning of the meal and they compliment the other dips and salads. And if you’re hungry but on the go, find a street-side stand and have a falafel sandwich for lunch! Chickpeas are a bit of a wonder-bean because they’re so versatile. Why don’t we in the west cook with chickpeas more often is what I’m wondering?! Alongside ful, manakish is a traditional breakfast or snack item that you can likely have made for you throughout the day too. The most popular form of manakish is served with the za’atar seasoning baked on top, which means a very flavorful piece of bread served fresh and warm from the oven. Also popular is manakish with a creamy cheese spread on top. Hard to say which was my favorite—I loved the riot of flavors in the za’atar manakish but also dug the way the cheese spread adds a bit of needed moisture to the baked pita bread. You should try both, they’re an inexpensive snack or breakfast! Bonus tip from a reader! Go to a bakery in the mornings (try Suf’ra in Swiefieh on Friday mornings) — they make fresh Mana’eesh or crumbled Haloumi in a pita fold and hot grilled. 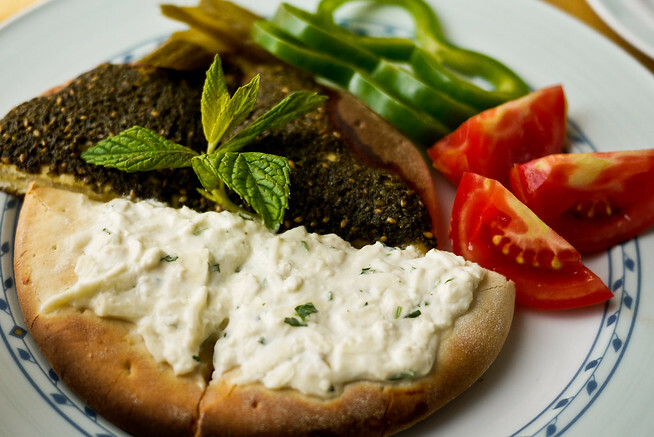 Mujaddara is a popular and very hearty option in the Levant region—order this dish and you won’t be hungry afterwards! Made with cooked lentils, most usually rice, and topped with roasted onions mujaddara is a filling choice and a great way to get some protein into your diet while in the Middle East. You might be lucky and find it served with a side dish of vegetables too! A vegetarian reader emailed in with this one. He notes that “freekeh is bulgur/wheat and usually made with chicken, but you can have them put veggies on top. Sounds like a great way to add a savory dish into the repertoire if you are traveling through Jordan. So tasty but utterly sweet. Which is bizzare because the dish is made with a thick cheese, which is not inherently sweet. The sweetness comes from the sweet and buttery shredded phyllo-like dough on top. I highly recommend hunting down knafeh because when I posted this same photo on the A Little Adrift Facebook page a debate broke out about who serves the best knafeh (consensus says: each person voted on their own mother’s recipe, go figure!). If you’re in Amman, Habiba’s small shop is well worth finding for a taste of delicious knafeh, or other popular Arabic sweets. These dishes constitute the bulk of the food I ate during my ten day trip to Jordan. It is far from an exhaustive list of the foods in the area, but should give traveling vegetarians a more clear understanding of the types of foods available. 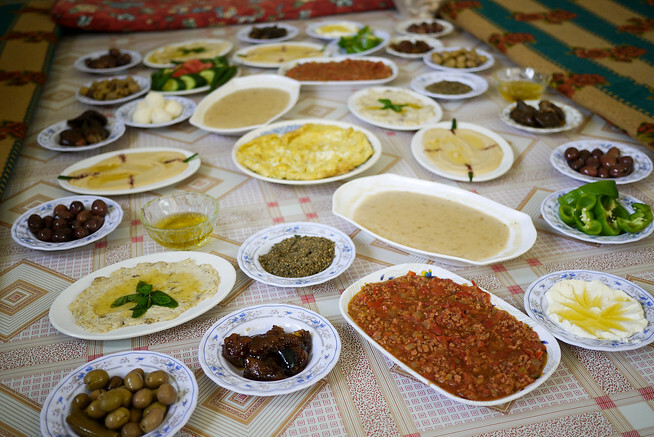 I loved traveling vegetarian in Jordan—besides some moments of explanation when eating with Bedouin, there was very little issue. In fact, I welcomed the freedom of traveling through a region with such a wide array of fresh fruits and vegetables, and even more than that, a focus on fresh and flavorful cuisine. Am I missing any other tasty vegetarian dishes from the Middle East and Jordan that should find a home on this list? Or, which one from the list is your hands-down favorite? Vegetarian Dishes from Across the Middle East: A beautiful book and delicious recipes if you want to try many of these dishes at home! Classic Vegetarian Cooking from the Middle East & North Africa: The fusion here is super interesting. I love North African foods as well, so these are intriguing flavor combinations that would wow at a party. Silk Road Vegetarian: Vegan, Vegetarian and Gluten Free Recipes for the Mindful Cook: Another fascinating book with dishes and crossing flavors and ideas from the entire Silk Road region. Recipes and Remembrances from an Eastern Mediterranean Kitchen: Combining story and food, this is a beautiful book that will give you recipes as well as inspiration once you are there. Mouthwatering Vegan Middle Eastern Dishes: This blog shares a wide range of vegetarian dishes from this region. And if you’re headed to Jordan, the Jordan Lonely Planet is one of the most recent and reliable guides to this region. One reader emailed with these additional suggestions. They all sound too delicious not to include! “One option I would mention is freekeh. 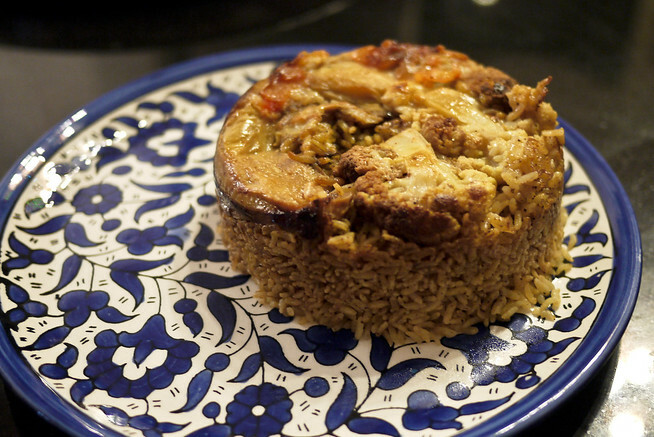 It is bulgur/wheat and usually made with chicken but you can have them put veggies on top — my favorite — if mezze is not enough!! For vegetarians, there are lovely seasonal fruits year round — whether fresh dates, figs, plums, persimmon and pomegranate. The best place I have found to get them in western amman is in Sweifieh near 6th circle/KFC in Amman. There is Suf’ra bakery and right next to it are the fruit shops. Next to it is the spice vendor who will only be too happy to explain what the different spices are. It is so wonderful to just smell them — thanks to the dry weather they are kept out in sacks and don’t spoil. what are some of your favorite grape leave ingredients? In the region they wrap all kinds of seasonings together in the grape leaves, rice is good, I have to be careful because some of them are meat though! :) Very tasty! Very resourceful post! I am so hungry and how amazing is vegetarian food. Real flavour! delicious olive oil really brings out the freshness in Mediterranean foods! A mouthwatering array. 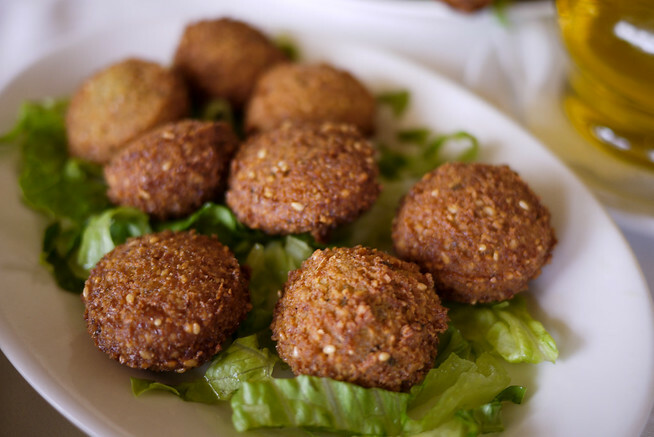 I love Middle Eastern dishes…with the exception, perhaps, of falafel. meat in the Middle East too! I swear all you did was make me hungry! This is similar to the place setting of food from my wife’s family who are from Ethiophia. Except you will never see any silverware. I enjoy eat Falafel but haven’t had any in a while. I would like to give the Knafeh a try! Will do, you have a deal! I wasn’t a fan of eating with my hands at first but its like trying chopsticks for the first time. Just get better at it the more you do it. That looks SO yummy, my favorite is hummous, but they all lookdelicious. Wow, great post! I’ve already been itching to go to Jordan, and now I can’t wait (not sure when I’m going to make it though :). Each story I read about the country draws me in more and more. comes up soon so you can go for a visit! I’m a Jordanian girl and i really advice everyone to visit Jordan it’s such a great Country and there’s way more places to see in here there’s plenty of desert castles and there’s Mujeb Nature Reserve it’s such a wonderful place just amazing !! and that’s Habiba shop is my fav place in here ;) and i wanna ask you Shannon did u visit The Roman Theater by any chance ? it’s a great place to go to. beat for some knafeh if I could!! Lonely Planet Twitter pointed me here. Good post, but I won’t be back because of your insanely annoying locked overlay of the facebook like, tweet and su buttons. In PC Firefox 5+ it blocks and ruins the readability of your article unless you have the window maximized. Some of us multi-task and don’t want to have to maximize the window to read and it’s annoying how it creeps along when reading. I’m doing some serious chop licking over here. Yum. Hard to believe such varieties in jordan……have perception about them being non veggies….would love to have Farmer’s Salad and dolma…even knafeh looking gr8…..so as you both!! Mouthwatering! I am so addicted to falafel after eating it nearly every day in the Middle East…I actually found a packet mix from Lebanon in a supermarket in Sydney which is pretty authentic but I have trouble getting the water/mix ratio right…it’s either too dry or too wet! I was thinking I was going to be forced into!). :) Yum! This is a wonderful overview of the different types of Mediterranean foods one could possibly try. When I was vegetarian for several years back in University I ate this kind of meal at least once a week. My personal favorites are Tabouleh and Falafel. Anyhow, a great post & I’m quite hungry now! 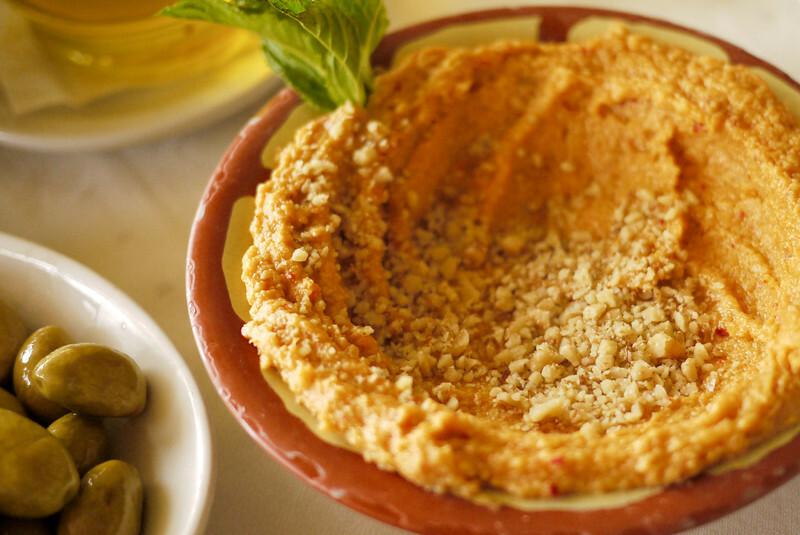 hummus nearly 5 days a week—so delicious with freshly chopped vegetables! Oh wow as a fellow veggie I’m drooling over your pics! What gorgeous pics you took of the food. Looks insanely delicious!!! This is why I want to go to the Middle East! Sounds fantastic for vegetarians and I love many of these dishes already so it’d be great to sample them at the source.